Every year is different. Some years start dry and end wet while others are exactly the opposite. 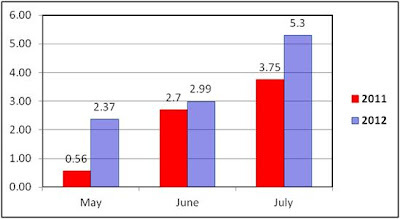 The very warm and dry month of May started the irrigation season much earlier than the last year. Our mostly dry July added up to a greater irrigation need despite the lack of significant high temperatures. This data is from the weather stations that feed our weather based irrigation. It is too early to tell, but despite this early difference, most years work out to be similar when you compare the entire season. Time will tell how the second half of the season works out. Unfortunately, you will likely see higher irrigation bills for the first half of the summer irrigaiton season, so be prepared when your bill arrives.